How much would you pay for this giant Hula Hoop crisp? Got a spare £80 lying around? Yeah, not us either. But imagine if you had loads of money. You could buy a Rolls Royce, a mansions, but most importantly, an authentic extra large Hula Hoop Crisp. Yep, someone is selling the crisp as a buy it now price of £80 although you can make an offer. The best bit about it is delivery free and it “Hasn’t been eaten or anything, I just found it in my packet”. We do love a bargain. When did everyone start collecting crisps? How are you going to post this? It’s a delicate crisp? Why would you buy ready salted Hula Hoops when salt and vinegar ones exist? Any why wouldn’t you eat it now? However, the seller will be donating 10% of the final price to Crisis, to help homeless in Bangladesh who don’t have any shelter or food. 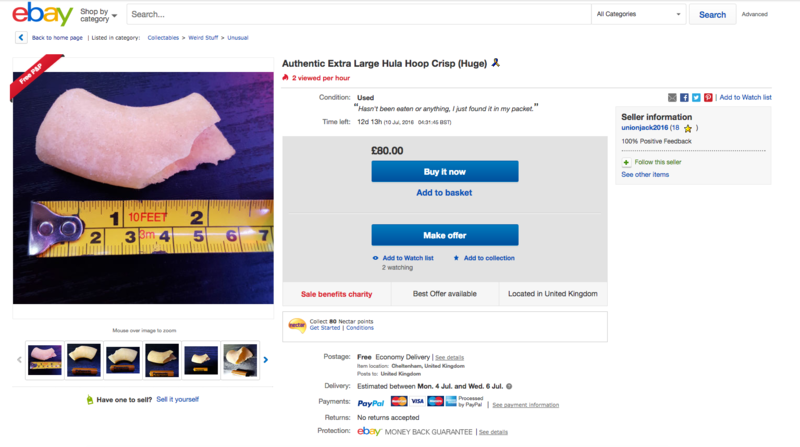 Sure, £80 sounds pricey, but the world’s largest Hula Hoop sold in 2014 for a massive £712, so really - this is pretty much free, if you’re into big crisps. Loved this? You’ll love these freebies even more.